Katerina was born and raised in Athens, Greece. After graduating from Athens College, she earned her Bachelors Degree in Marketing Communications at Deree College. She started off her professional career at Davlas & Partners, one of the oldest and most recognized PR companies in Greece, by organizing corporate and private events. This position was a strong match with her extrovert personality. 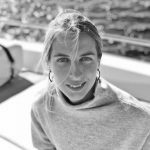 Katerina then moved on into the marketing and advertising world by joining Tribe, a member of Spot Thompson and one of the leading advertising agencies globally. After three years of Account Management, primarily for the banking sector, she took on a more commercial role, as General Manager Greece for the international brand “Happy Socks”. With a robust experience in sales, marketing and communications Katerina decided to enter the yachting world, where her strong interpersonal skills were well appreciated by her new home at IYC. During her free time, Katerina enjoys traveling and discovering off the beaten path destinations. She is also an avid waterskier and loves to train and participate in slalom competitions, always keeping herself close to her favorite element, the sea.